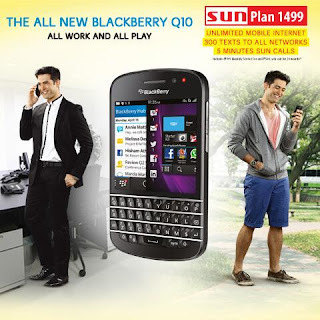 Sun Cellular Postpaid now offering Blackberry Q10 free at Sun Plan 1499 with free unlimited data usage and call and text services. Blackberry Q10 comes with a QWERTY keypad with 3.1 inch screen size that runs on their latest Blackberry OS 10 and upgradable to v10.1 if supported on our country. This is the smaller brother of Z10 with classic look in a completely renewed OS. Announced in Philippines early this year along with Blackberry Z10, which is already available on Sun postpaid. Q10 sports 1.5GHz dual core processor with 2 GB RAM and 16 GB internal storage, enough to handle files and do multi-tasking. See what you can get with your 1499 pesos monthly charge. If you’re looking to compare or review the spec of Blackberry Q10 before available on Sun Postpaid plan, you can see provided quick specifications below.